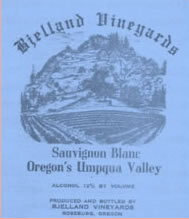 In 1968, Californian Paul Bjelland moved to the Umpqua Valley near Roseburg. He bought a 200 acre farm, planted a small vineyard, and built a winery. Soon he married Mary, a Norwegian school teacher who taught at a local high school. 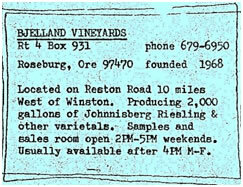 In 1969 they bonded their winery, #47, one of the earliest wineries in Oregon since prohibition ended. Bjelland became best known for its full flavored fruit wines made by Mary. Wild blackberry and woodruff flavored May wine were best sellers. Paul was instrumental in founding the Oregon Winegrowers Association and establishing the “Greatest of the Grape” summer wine festival which continues today. The winery was located at Bjelland Vineyards Lane, Roseburg, Oregon. In the late 1980’s the Bjelland’s sold the winery to Gary & Sandra Davidson who established Davidson Winery.